Cocito represents the lower part of Hell, frozen and evil, as devised by Dante Alighieri, the most prominent Italian poet. Designed by Stefano Protino and printed by LPCC on "Classic Finish" in their Taiwan factory, Inferno Cocito Playing Cards is embellished by a custom tuck case, printed with fine details on Fedigoni Materica paper, embossed and foiled. The center of the back is a circle containing spikes of ice, with the famous quote from the poem itself: "Lasciate ogni speranza voi ch'entrate" (Abandon all hope, you who enter here). 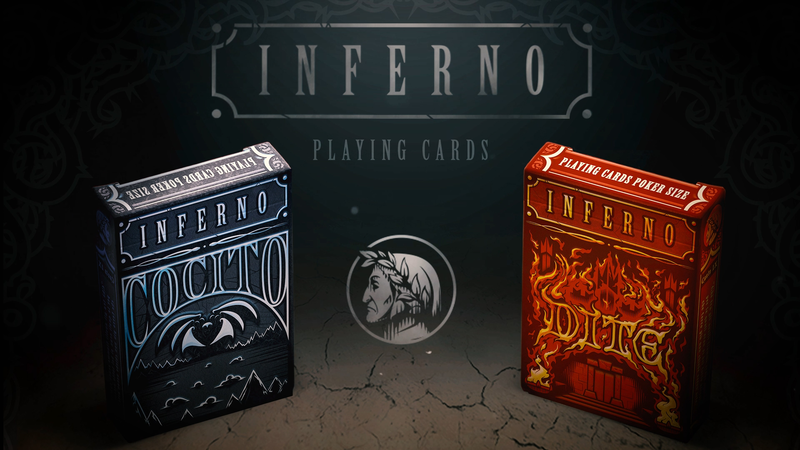 The court cards and the Aces represent characters that Dante and Virgilio (his guide), meet during the journey in Hell, until they find Lucifer himself. The Jokers in Inferno Cocito show Lucifer, as described by Dante: a demon with three faces, munching with his three mouths on the three worst sinners (according to Dante): Judas, Brutus, and Cassius.